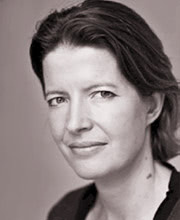 Lucy Scott trained at the Royal Central School of Speech and Drama. Her stage credits include Emma (Tricycle Theatre), Search and Destroy (New End Theatre) and Mansfield Park (Chichester Festival). Her television credits include Pride and Prejudice (BBC), Rosemary and Thyme (ITV) and Spooks (BBC). She also appeared in the film Tom Brown’s Schooldays with Stephen Fry. She has narrated many audiobooks.